Following Rep. Nancy Pelosi’s (D-Calif.) statement that she didn’t think it's possible to pass the Senate version of the health care bill in the House, Rep. Mike Pence (R-Ind.) said that the pro-abortion language in the bill played a “critical role” in its demise. 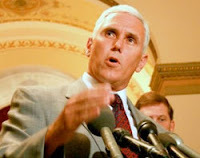 During an interview with Cybercast News at last Friday’s March for Life in Washington D.C., Rep. Pence credited “the pro-life Republicans and Democrats who took a stand in the House of Representatives on the traditional language that was encompassed first in the Hyde Amendment and then in the Stupak-Pitts Amendment,” noting that their work contributed immensely to the current situation of health care reform. Unlike the House version of the health care bill, which included Hyde amendment restrictions on the federal funding of abortion in the Stupak-Pitts amendment, the Senate version mandated all federally funded health insurance policies to have one option that included abortion. The Senate bill also included what Health and Human Services Secretary Kathleen Sebelius called an “accounting procedure” that earmarked a portion of every premium in the health care exchange for a fund that would pay for abortions.